I've really been inspired by the 1970s lately, not in the overly hippie/bohemian sort of way (I went through that phase a few years ago), but in the sophisticated clean lines of cotton camisoles, dark denim a-line skirts, and sleek floral print maxi dresses. I will be posting one of my favorite 1970's vintage inspired editorials soon which best explains my current fashion state of mind. the 70's are pretty amazing...i really enjoy that style from clothing, music, art & home decor! my house is filled with 70's items!! LOVE those shoes! I love this collection, I could definitely see myself wearing the long dress with the hat! 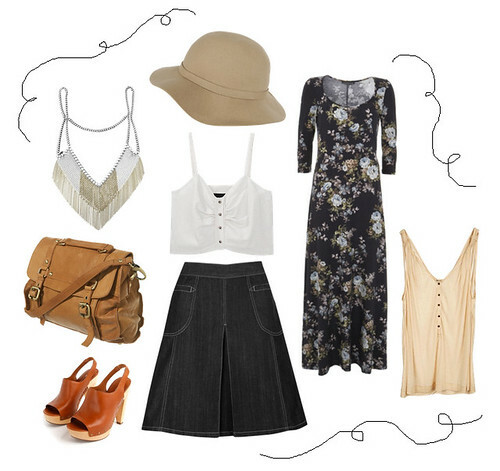 Love the style.I think the maxi dress and the hat would be perfect together! your blog is rather cute indeed! I'm loving that tan satchel!! Of course I have no need for it but I want it! !